Protein A Resins Market size is set to exceed USD 900 million by 2024; according to a new research report by Global Market Insights. Demand for monoclonal antibodies is increasing rapidly from past few years due to its wide range of applications in the management of chronic diseases such as cancer. In response to increasing demand, manufacturers are optimizing their production capacities and launching new plants for large scale production of monoclonal antibodies. Several monoclonal antibodies have already been approved while many are still in the late phase of clinical trials. Increasing production of monoclonal antibodies will escalate the need of protein A resins for antibody purification on large scale impacting industry growth. Antibody purification application segment accounted for majority of shares in 2016 due to increasing usage of protein A resins for purification of monoclonal antibodies on large scale. Increasing prevalence of chronic diseases such as cancer has stimulated the demand for better biologics. This has triggered the large-scale production of monoclonal antibodies that will further augment antibody purification segment growth. Recombinant protein A resins product segment is poised to witness lucrative growth over the forecast period owing to some advantages associated with the usage of recombinant protein A resins. For instance, some vendors are putting efforts to apply recombinant techniques to improve ligand’s tolerance to NaOH. 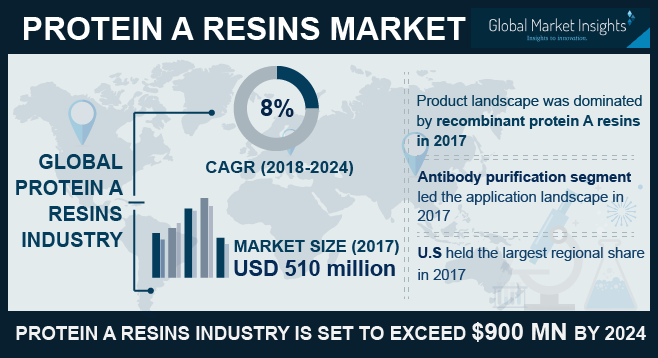 Agarose based matrix type dominated global protein A resins market in 2017, and the scenario is likely to remain so in forthcoming years. Qualities such as firmness, good resolution at a minimum time coupled with the ongoing development and launch of high quality agarose-based products will further support the segment growth over foreseeable future. Clinical research laboratories are poised to be fastest growing end user segment owing to increasing research and clinical trials on monoclonal antibodies. Increasing demand for monoclonal antibodies for the management of chronic diseases will render positive impact on the segment growth. Germany currently dominates Europe protein A resins market due to ongoing R&D activities in biopharma industry. Germany is amongst the Europe’s largest biopharmaceutical producer and looked upon as a favored location for conducting clinical trials. Robust growth in biopharmaceutical sector ongoing development of pharmaceutical products will support the Germany protein a resin industry growth. APAC protein A resins market will witness significant growth owing to improved healthcare infrastructure, presence of big patient pool and increasing demand for better biologics to treat the chronic diseases. Indian and China are forecasted to drive regional growth while japan is predicted to remain mature market over the forecast timeframe. Some of the key industry players operating in global protein A resin market are Agarose Bead Technologies (ABT), Bio-Rad Laboratories, Danaher Corporation, EMD Millipore, Expedeon, GE Healthcare, GenScript Corporation, Novasep, Repligen, Sigma-Aldrich Corporation, Takara Bio, Thermo Fisher Scientific, Tosoh Bioscience. The industry players are focusing on new product development for strengthening their position and broaden their product portfolio. For instance, in September 2017, GE healthcare launched MabSelect PrismA, a new protein A chromatography resin for capturing monoclonal antibodies.